Vermont South is located in the eastern part of Melbourne close to the Dandenong Ranges. Homes in this area tend to be older style and ripe for a DIY kitchen renovation. As seen here the old kitchen although functional, lacked the flow required for this Daughter and her Mum to prepare the many number of feasts the family and extended family enjoys. 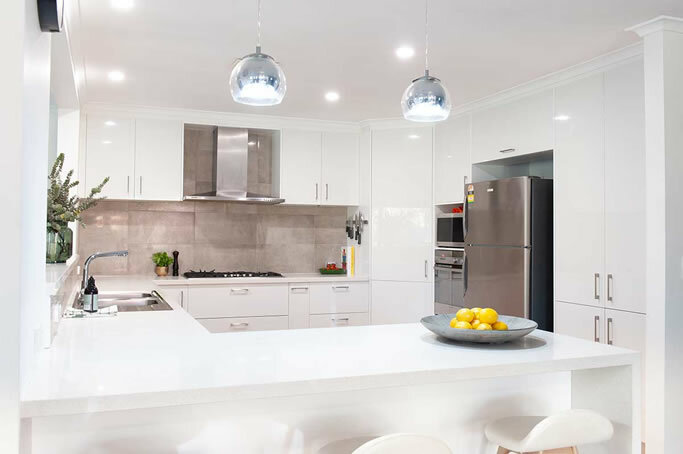 The initial research for a new kitchen was extensive, using the internet to search for companies that could provide a modern high-quality kitchen but without the huge price tag. 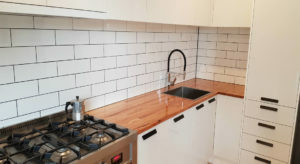 As seen here the final DIY kitchen renovation looks state of the art and has added enormous value in both dollars to the saleable price of their home but most importantly in functionality and everyday enjoyment. In the initial design in the showroom, a key criteria was to increase the work area within the kitchen so a minimum of two chefs could be preparing at the same time. With this in mind, it made sense to remove the standalone island bench that is now quite outdated. Doing this has allowed a larger open space whilst still maintaining a fully functional island bench where the family can perch. The functionality of the kitchen having designed around the kitchen work triangle now flows easily from fridge to oven/cooktop to sink – perfect. 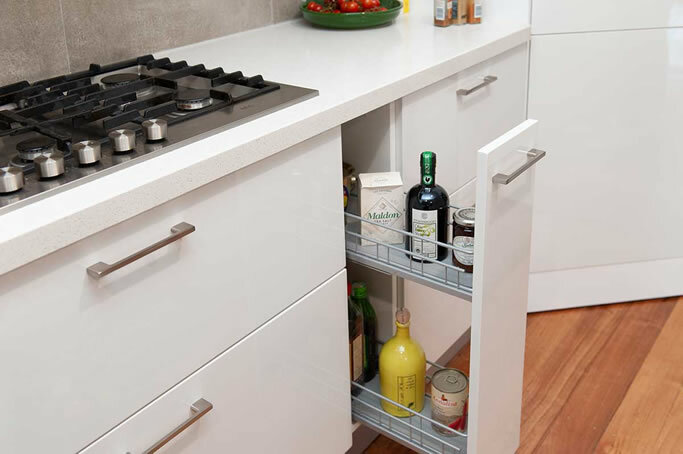 The addition of the corner pantry has also ensured that those items required for cooking are easily within arms reach to the large cooktop closeby. 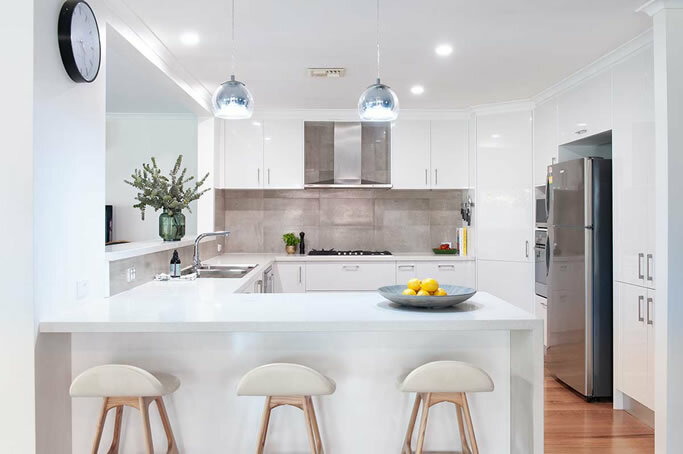 This new DIY kitchen renovation has transformed this family’s home into a bright, open space and best of all has saved them $1000’s. We know that their kitchen will last for many years to come and provide daily cooking enjoyment. Owners: A family and extended family who enjoys banquet cooking. The kitchen design required better flow so two or more chefs could be cooking at the same time without getting in each other’s way. 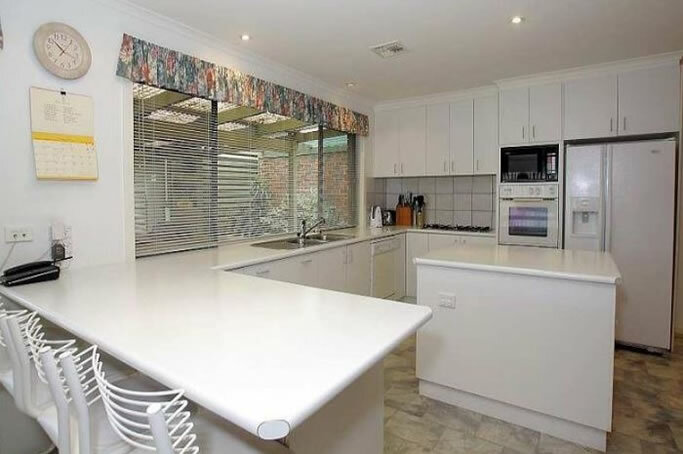 The high gloss white style cabinetry has provided an open space with the mirror finish the customers love. Adding the soft tones of the tiling as splashback has created a bright yet soft feel topped off with stainless steel appliances and handles.